I’ve just been reading with my 8 month old son. His favourite book at the moment is That’s not my Santa. The book is part of the “That’s not my” series by Rachel Wells. 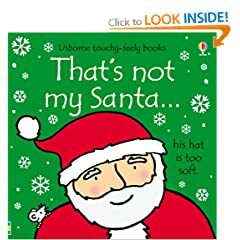 Each book follows the same pattern; 5 examples of the subject, in this case Santa, that are not “mine” for some reason. That’s not my Santa. His sleigh is too sparkly. And the final page shows an example of a Santa that is mine. That’s my Santa! His beard is so fluffy. Each page has a some textures on it to backup the statement being made about Santa; Fluff on Santa’s beard, shiny paper on his sleigh that kind of thing. Pre-school kids just love these books. They’re made of thick card, so can withstand even the most determined of teeth-er! That’s not my code. You can’t see the whole function on a single screen. That’s not my code. It contains magic numbers. That’s not my code. It doesn’t have any unit tests. That’s not my code. It’s not been code reviewed. That’s not my code. It’s got duplicated logic. That’s my code. It can be read by humans as well as computers. So, come on, get the the Christmas spirit – If you were to author That’s not my code how would it read? That’s not my code. It doesn’t work.